One of our favorite Fusion laboratories is pretty much a one-man show. He is young, very precise and very energetic. Fusion is a lot like baking cookies. You cut the dough, you cook the dough and you decorate. Only it takes skill and patience, diamond saws, lost of dust and you best be careful. 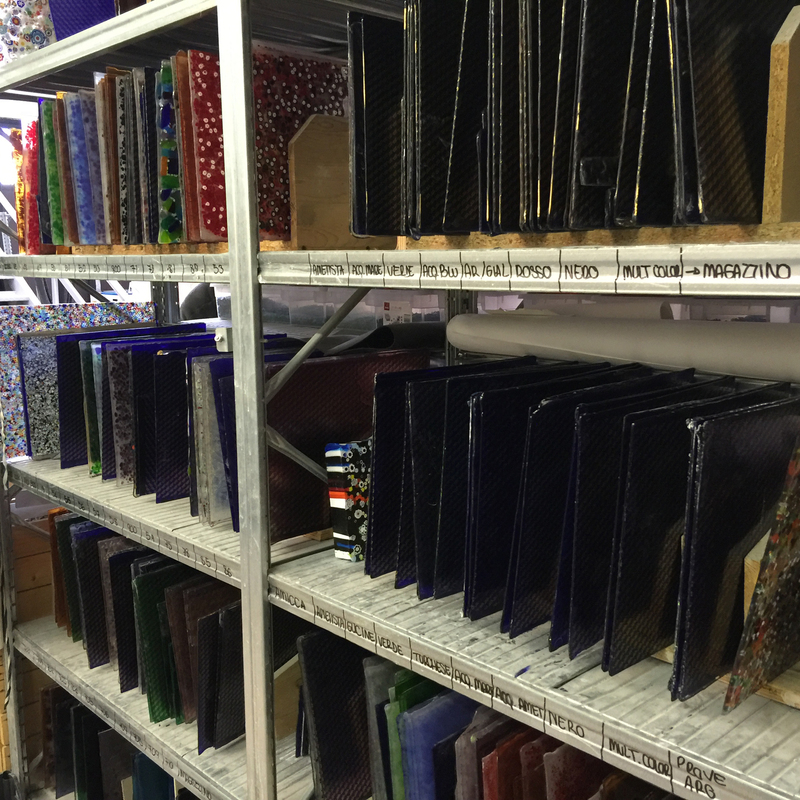 The glass arrives from the furnace in Murano in large square sheets, which must be cut into workable pieces. Each piece goes through at least two firings. 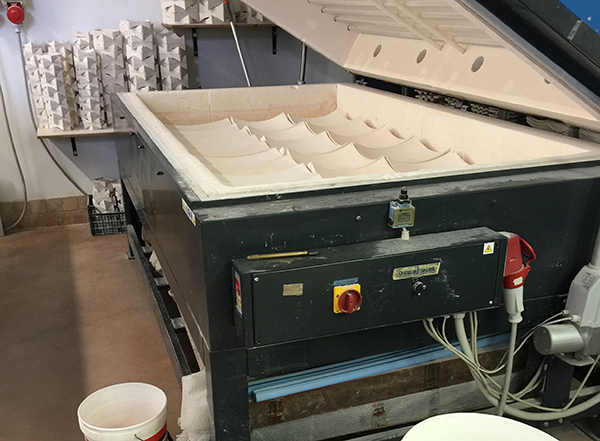 So if you have ever worked in ceramic, you will have an idea of the process. These sheets neatly arranged have already been through the first step. They are now ready to cut into shapes and slump if needed. Don’t you love how they are so organized. This is one of the wonderful things about this facility. 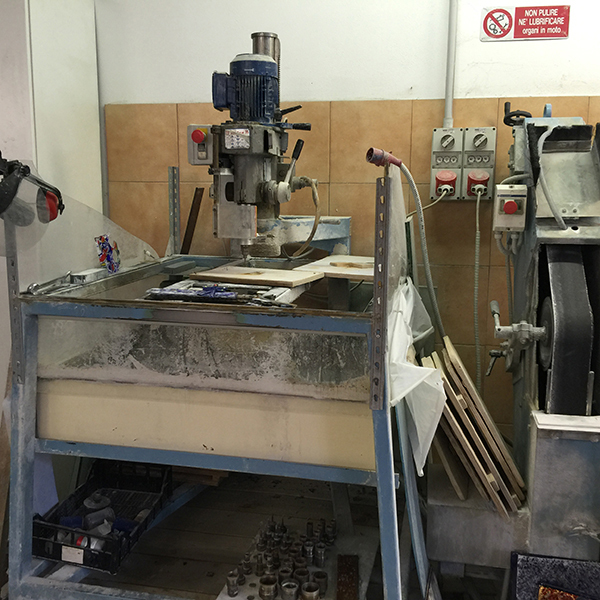 Sawing and Sanding are two important, if dirty, dusty steps in getting the perfect pendant. 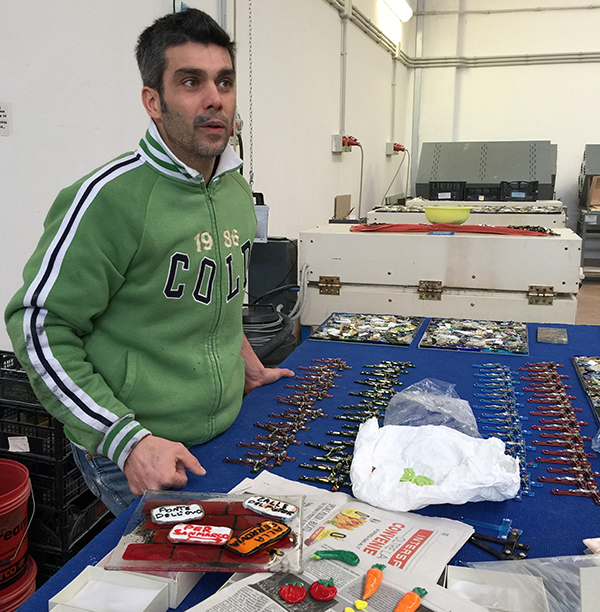 His careful attention to these assure us of great quality Murano Glass Pendants. 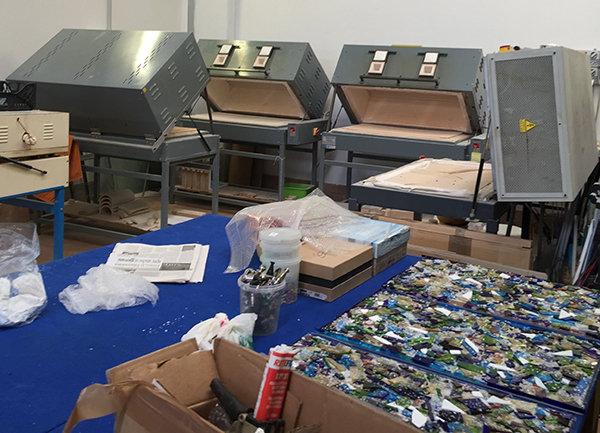 These kilns are used in the first step and you can see some pendants in process on the table. The decorations (colors, millefiori, gold and silver) are done in sandwich style on a base layer of Murano glass. Frit, small pieces of glass, add color as do the millefiori. After this first step the sheets will be ready for cutting and the second step. With glass we are taking to the melting point so that the small pieces fuse together. This is done as a flat sheet. Here you see a kiln prepared for the 2nd firing, called slumping in English. This firing only heats just before the melting point, staying at this range until the glass relaxes into the shapes. Then it is cooled very slowly, called annealing. Behind you see stacks of moulds for other shapes. The world of Glass in Murano and Venice requires many different skills and equipment but always at the heart is the beautiful Murano Glass. Yes, it is organized! I wish my creative process & work were as well organized. Seeing the finished pendants, I have always wondered how they came to be, 1 at a time or as a larger project then smaller. I can see the work is in the details, no wonder they are so pretty.